The GLA and the London Development Agency have released a new report about how much greenhouse gas is accounted for by our food. In London, it says, our eating habits cause nearly 19 million tonnes of greenhouse gases - including CO2, methane and nitrous oxide. A great deal of that is in its production and transport. Another great reason to start growing your own food - and if you can't get an allotment or don't have a garden, to sign up for our garden-sharing scheme. Related to this, our upcoming film screening shows the incredible potential of urban agriculture: Havana now produces more than half of its vegetable needs inside the city itself. Londoners eat 8 billion meals a year and just 2 million of those are accounted for by food grown on allotments, so we have some way to go to approach Havana's self-reliance - not surprising when we have 100,000 people on allotment waiting lists nationwide, itching to have get dirt under their nails but still frustrated. If there are any passionate environmentalists out there who want to reclaim the 'treehugger' insult as a badge of honour, you'll find company in Greenwich Park it seems. Transitioners tend to be more about practicalities, but it can't hurt to have an arboreal embrace once in a while. 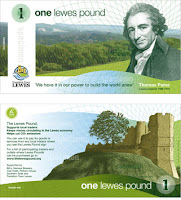 The idea is that a specially printed currency, valid only in the area's independent shops, will work harder for local people than sterling, because money spent in local shops circulates three times more than money spent in national chains. Each Brixton pound will be worth £1, and sterling can be exchanged for the Brixton pounds at issuing points in the area. An experiment well worth supporting, so if you know any Brixtonites, encourage them to get in touch with Transition Town Brixton and pledge to be one of the first to buy 10 Brixton Pounds. This new film is creating quite a buzz. It stars Pete Postlethwaite as a man living alone in the devastated world of 2055, looking back and wondering why we didn't stop climate change when we had the chance. By all accounts it's a cracking film, and in fact a great motivator for those who have seen it. The story behind the film is just as compelling. A real word-of-mouth phenomenon, it is only making it to the big screen after winning a competition whose prize was conversion to the digital format needed for cinemas. But it still needs help: it will be on limited release in its first week, and getting an extended run depends entirely on it doing well in that first week, so there is a campaign to encourage people to make a special effort to see it. Happily, the Greenwich Odeon (but not, sadly, the Picturehouse) will be showing it. Tickets can be purchased by clicking here - but it might make a fun collective outing for all those interested in Transition Greenwich, so perhaps we could meet before and/or after the screening. Something to discuss at Transition Drinks tomorrow night. It will have its big (solar-powered) premiere in a huge tent in Leicester Square, and live feed from that event will be beamed to the participating cinemas, including Greenwich, on Sunday 15 March. So if you want to take part but don't want to brave the crowds of central London, Greenwich looks like a good option. If you can't make it on the night of the premiere, you can catch in its first proper week, starting 20 March. You still have a little time to catch this programme on the BBC's iPlayer website, and I can't recommend it highly enough. Wildlife film maker Rebecca Hosking takes a long hard look at whether the methods used by her ageing father and uncle to tend their farm in Devon can continue when cheap and easy oil runs out. She's clearly shaken by the realisation of how vulnerable mechanised farming is, with cattle feed, machinery, transport, fertilisers and pesticides all dependent on fossil fuels. A fascinating clip when she attends a Soil Association conference on the subject shows a room full of farmers listening intently but looking, one and all, as if they've seen a ghost - and the ghost is their farm, their way of doing things. 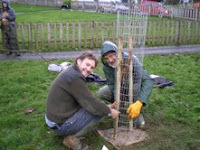 Sceptical that hippy dippy organic and permaculture methods can feed the UK, which is a net importer of food and therefore particularly vulnerable to interruptions in oil and gas supply, she is amazed to find that careful permaculture, and in particular the abundance possible through 'forest gardening', can produce more food per acre than mechanised farms. She talks to the big brains of peak oil, including Colin Campbell and Richard Heinberg, for the bleak reality check. But the pleasure is in seeing her meet pioneering permaculturists delivering practical proof of how productive their methods can be by working with and imitating natural systems instead of exhausting soil and biodiversity by battling against nature. If you have a spare 50 minutes, do have a look. At the moment there are 21 days left to watch it from here. It makes a nice companion film for the documentary we are screening for free next month on how Cuba coped when its oil supplies were cut off. Do come along on 25 March if you can, and bring a friend. We are pround to launch the first Transition Westcombe project today. Patch Match is a garden-sharing project aiming to match up people with spare space in their gardens with others who want to grow their own food but who don't have a garden and cannot get an allotment. We think there is real demand for this free service. Allotment waiting lists across London are groaning, and have grown tenfold in the last 15 years or so. If you have tried recently to put your name on the waiting list for our local sites, on Humber Road and by Maze Hill station, you probably found that, not only was the wait likely to be long (over 10 years at Humber Road), but in fact you could not even join the waiting list, as they have been closed to new names. Meanwhile, there are many people in Westcombe who have gardens but for various reasons cannot make full use of them but would be glad to see them used for growing food. Patch Match hopes to put these two sets of people in touch. We hope this will do something to increase the amount of food grown locally, so increasing our resilience and food security and cutting our food miles and carbon emissions. It could also help to strenghthen our community by putting people in touch with their near neighbours - if you're coming to see our free film screening on 25 March, you might agree after seeing it how important that is to a society's ability to survive and thrive under stress. Find out more or sign up at www.patchmatch.blogspot.com. If you have neighbours you think would like to take part but who do not have online lives, you could print the details and take them round to them. But we do hope to have posters and flyers in local shops and libraries before long. Transition Westcombe will be holding a free film screening on 25 March, open to all. The Power of Community: How Cuba Survived Peak Oil is a fascinating documentary about how Cuba suffered but then rallied to survive its own artificial peak oil moment in the early 1990s. Oil imports fell by more than half when its main supplier, the Soviet Union, collapsed. The effects were devastating. The problems of Cuba's 'special period' - and especially the country's collaborative, co-operative and creative response - holds valuable lessons for the rest of us as we continue to consume 5 barrels of oil for every new one we discover and, unlike many peak oil films, it's not bleak but instead inspiring, motivating and rather beautiful. The film is under an hour long, so little danger of numb bums, and it will also be a chance to learn more about Transition Westcombe and the transition idea generally, for those who have questions, or a chance to get involved for those who want to. The venue is St George's Church in Kirkside Road, who have kindly allowed us to put the screening on there. We'll start at 7.30pm, but feel free to arrive a little early to say hello to others. Feel free to spread the word to anyone you think might be interested. If you're the member of a local organisation, do tell the other members. If you ever find yourself spying an underused piece of land, which seems to be sitting idly with no obvious use, and wondered how it might be posssible to go about putting it into productive use, then you should be interested in Capital Growth. This is the now-Boris-endorsed project to create 2,012 new food growing spaces in London by 2012. Not only that, it aims to harness your musings about those odd unused nooks, crannies, parcels, patches, corners and strips of land. Capital Growth offers, if you get in touch, to do the legwork of identifying the owners of the land and then embarking on the negotiations about how to put the land into community use for food-growing. They also have a pot of funding totalling £50,000 (possibly to rise) for making small grants to help create these spaces. One Transition Westcombe member has been in touch to supply us with the application form (email to request it if you wish), and to ponder whether part of the land at Mycenae House could be used for food-growing and whether these grants could be accessed for that. One for discussion and debate, perhaps, at Transition Drinks on 25 February. See you there. Concerns about peak oil were, until recently, often dismissed as an obsession for fringe lunatics only. You hear this less often recently, as episodes like the Russian gas supply crisis and the wildly fluctuating oil price have led people to look more seriously at energy security. But it is a charge that still deters some people from looking more deeply at peak oil's implications, even if they have heard the phrase. So it's interesting to note when each weighty insitution starts to address the issue seriously. I suspect we're nearing a tipping point in public and institutional awareness of energy insecurity. The latest recruit? The Local Government Association. This revolution [in energy use and supply] will also be driven by volatile and rising fossil fuel costs and concern about fuel security, particularly if oil production peaks. As oil and gas prices increase, the economic incentives to develop low-carbon goods and services intensify. There will be impacts on existing sectors - forestry and agriculture, construction and refurbishment, travel and tourism, distribution and logistics. There is a growing awareness of the risks associated with dependence on imported fossil fuels and the threat posed by peak oil. As we write there is a stand-off between Russia and Ukraine that has cut off gas supplies to many countries in Europe. So if you find yourself slandered as a fringe lunatic for espousing peak oil, now you can ask your accuser: "Is the Local Government Association a fringe lunatic, too?" This is another item not related directly to Westcombe Park, but I liked this as an illustration of our dependency. 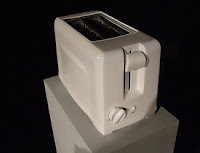 Thomas Thwaites is an artist who is trying to build a replica of your bog-standard cheap toaster from scratch. Not just collecting the various parts and assembling them, but creating the plastic moulding from oil, constructing the wiring, melting the ore for iron. He expects to end up with a rather sad-looking pastiche of an industrially manufactured toaster, despite his best efforts. His point seems to be that, even for the simple process of turning bread into toast, we depend on consumer appliances created by huge industrial processes that are simply beyond our ability to replicate without the absurd amount of effort he is going to. It raises questions, he thinks, "about economics, helplessness, and life as a consumer". Helplessness is, of course, one of the things that transition groups try to address by making communities more self-reliant, more resilient, sourcing more of their own needs locally. The toaster example does act as a (troubling) indicator of where we are: the daily, all-pervasive ways in which we depend on oil and on the industrial processes which may soon lack the supply of oil needed to sustain them - and to sustain us. It's also a good example of the million ways in which we are dependent without even realising it, stumbling to the kitchen bleary-eyed to make our toast each morning without acknowledging the strange miracle that made it possible. Personally, I find it sometimes terrifying, but also often empowering, to spot these daily dependencies. Without seeing them you cannot begin to address them. We are holding an informal meet-up for anyone and everyone interested in getting involved in Transition Westcombe or simply in learning more about it. Drop in any time between the times listed above, as it's not a formal meeting. Thanks to those who have been in touch to say they want to get involved - it's great to learn that there are more near-neighbours out there thinking about transition issues and eager to take action. Please bring along anyone else you think might be interested, and feel free to spread the word. We've chosen a time - 6.15pm to 8pm - which we hope gives people a good chance of being able to pop in. And of course there is no reason not to linger later than 8pm if you're enjoying yourself. This will not be a formal meeting, but a chance to meet over drinks, get to know each other a little, exchange ideas and get or give updates on what TW is and where it might be going at this early stage in its life. Just turn up and ask 'Are you here for Transition Westcombe? ', or look out for people clutching the Transition Handbook. If there is enough interest, we will look at holding these meet-ups on a regular basis, so if you want to come but cannot, please let us know so we know how much interest there is in doing this again. If you do know of other people in or around Westcombe who you think would be interested in Transition Westcombe, do encourage them to email transitionwestcombeATgooglemail.com (replace the 'AT' with '@') so they can receive updates. The more the merrier. If they don't live or work in Westcombe but are elsewhere in Greenwich or just over the borough boundary into Lewisham, we'd still be glad to hear from them, as they may want to form transition groups in their neighbourhood and forge links with us. We all know how blowy it can get out on the heath, and many of us must have wondered to ourselves while our umbrellas are being blown inside out: "Why not plonk a couple of wind turbines there?"
. Thanks, Bugle. I've shamelessly nicked your clever photomontage above, showing how a beturbined heath might look. A more recent Bugle entry suggests the heath really was used for windpower before any of us were around. Our reliable witness is Turner himself. Could commissioning a feasibility study be an early project for Transition Westcombe? Or does anyone know if one has been done in the past? Leave comments below if you've got anything to say on this. Next: We'll have details soon of a Transition Westcombe meet-up open to anyone interested in getting involved. This is not Westcombe-related (except that there are probably plenty of coffee-drinkers here), but I enjoyed this. 'Do more with less' is a great, constructive way of expressing what we all need to do. A catchphrase for these times. If you've visited before, you'll notice above that we've got a new logo for Transition Westcombe. The old leaf logo was really a temporary thing until something better came along - and how it has! Some might recognise this unique 360-degree photography technique as the work of a local artist, who is a member of TW and who has put a great deal of time, effort, skill and creativity into this logo, so many thanks to him. 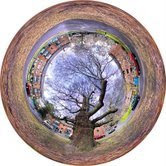 It's a huge improvement - and when spring and summer come, we may well see it evolve into a version with the tree in leaf, which nicely echoes the idea of undergoing transition. This old tree is a great example of natural resilience, too, having lasted for centuries while the world transformed around it - I'm told it's the second oldest of its species in the country (though I suspect many claim that title). The first to identify the street AND species correctly wins, let's see... a low-energy lightbulb. Finally for now, thanks to all those who have been emailing to register their interest in TW. We are still at a very early stage, but we intend as soon as possible to arrange some kind of forum, for those who want to get really involved, to meet each other and do so. Watch this space. Transition Towns are intended to be vehicles for creating or supporting real, visible, useful projects. With Transition Westcombe at this early stage, some people may be thinking: 'I get the concept, but what will it actually do? That is up to the people who get involved, of course - each Transition initiative is made unique by the local people and the resources they have. But by way of illustration, here are just a few of the projects that transition initiatives elsewhere have managed to get off the ground or which are being planned. But what would you like to see happening in Westcombe? Which of these ideas should we cherrypick or adapt, and what new ideas can you suggest? Feel free to use the comments section to post your thoughts. Someone has emailed a list I subscribe to with an interesting point: that if the economy were more localised, with more people working closer to home as in the past, we wouldn't have seen such a widespread shutdown of workplaces and schools because the hazards and the effort of getting to class or to office would be less. "Most of the problems caused by even mild snow falls, such as we have just had, come from the move away from local economies that has occurred in the last 40 years. Sorry to sound like an old fart, but when I were a lad nearly everyone in my town walked or biked a mile or two to work, or did if their car was out of action, and did it whatever the weather." Is this a rose-tinted view of the past or a genuine example of how we have become less resilient to sudden shocks? What do you think? A big thanks is due to the Westcombe News for putting our article about the transition towns concept so prominently on pages 1 and 3 of the latest issue, which we hope has lit the touchpaper and whetted people's interest. If you don't get the WN delivered, you should be able to see it within a few weeks by clicking here. If you want to get involved or simply be kept up to date on upcoming Transition Westcombe events, simply email us at transitionwestcombeATgooglemail.com (replace 'AT' with '@'). We promise not to swamp your inbox, as we intend to send only occasional messages, and of course you can unsubscribe at any time. What was particularly interesting about the new issue of the Westcombe News is that so many of the articles touched on 'transition' themes, which are increasingly preoccupying people even if they aren't labelled as such. A piece about the need to preserve local businesses and shops ('use them or lose them') fits very snugly with the transition towns' drive to localise the economy so that we get more of our basic needs from within the local community, making us more resilient to whatever shocks are thrown at us by economic turmoil, the end of cheap-and-easy oil and the challenge of combating climate change. Inside, Anne Robins from the Victorian Society talked about the importance - and the difficulty - of making Westcombe's many Victorian buildings more energy efficient. As she writes, they were built 'in an era of different energy needs and technology', and creative ways of adapting them now have to be found. Elsewhere, other transition towns have gone at this issue with gusto, even arranging for residents to buy insulation, renewable energy equipment or energy efficiency measures in bulk in order to cut the cost. Perhaps we can put our heads together and come up with a similar scheme in Westcombe.